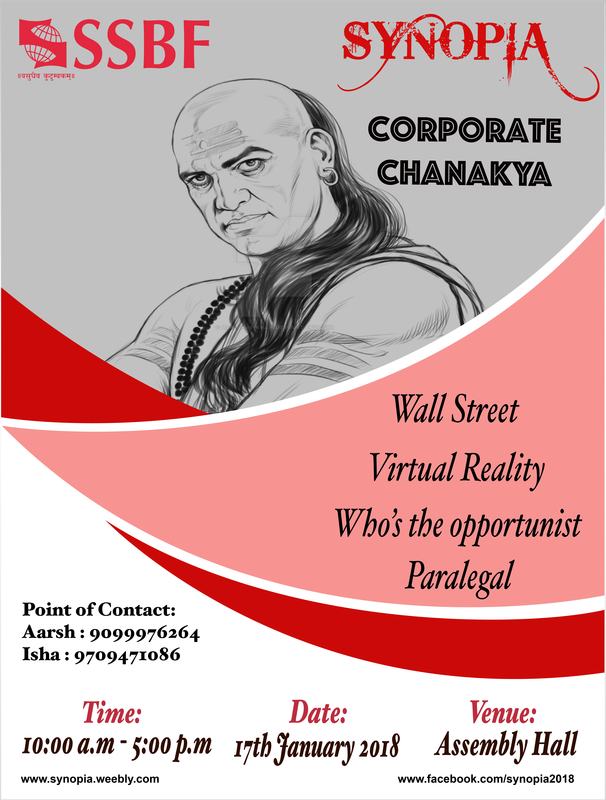 Corporate Chanakya is the hunt for the ultimate management guru. It will take place in three stages as explained below. One cannot deny the importance which money exerts on an individual. He/she can fulfill all his dreams and aspirations and can have the entire world in his/her palms. Keeping this fact in mind, the cultural committee has brought forward this thrilling competition for all those aspirants who have the determination and guts to try and mould their fortunes into minting huge loads of money. If the volatility of the stock market, the peaks, the crest, the bulls, the bears and the financial fundas are at your fingertips, then this contest is all you need to prove your worth. The contestants are required to apply their basic understanding of stock markets to become the ultimate investor. All teams will act as investors. The teams will be given Rs.50,000 as virtual money. There will be 10 companies in which they can invest. Brief profile of all the companies would be given. In the first round they will be given a set of news & rumors. The investors have to judge the stock movement on the basis of these news and rumors and, keeping in mind the given portfolio of the companies, they have to invest accordingly. In the second round, a set of new stock prices will be provided (based on the news and rumors of the previous rounds). The news and rumors provided in this round will act as the basis for setting stock prices for the next round. This will continue till 2 rounds. “The fact that all of this was happening in virtual space made no difference”. Being virtually killed by virtual laser in virtual space is just as effective as the real thing, because you are as dead as you think you are. ― Douglas Adams. In today’s scenario, Advertisements have become the lifeblood of marketing. Indeed, it is the undue influence of advertisements, which attract the customers towards the products being marketed and play a significant role in shaping their buying decisions. A written preliminary round with basic questions on logo identification, popular brand taglines, endorsements and other trivia, along with punch-line making; to filter majority participants. Each team will be allotted a deliberately goofy tagline, based on which they have to devise an entirely new product/service and prepare a small, preferably humorous ad (skit and jingle) on the same. Audience reactions will be an important barometer of judgment. Ever reasoned why Microsoft and Yahoo didn't settle but Tata and Corus joined hands even when both of them were profit-making organizations? Put yourself in the shoes of the CEO of the firms assigned to you. Few companies of different genre will be selected and their annual reports will be provided to the participants out of which they will have to reason their decision of merging their firms or acquiring them with the listed ones. They will have to do a thorough research about their assets, liabilities and propose decisions to lead their company to newer heights. This event will be held in two stages. Impact and Benefits of the M/A deal. Human perception plays a very important role in our day to day lives, which is highly influenced by the media. They label someone as a devil and the audience feeds on what is served to them. So let us hear the opposite stand and try to figure out as to why somebody tries to walk on the path that is socially unacceptable. SO, LET’S DEFEND THE DEVIL!!! Entries in the form of a two-member’s team. On the day of competition, case studies to be allotted to each team through draw of lots. Each team will have to defend the devil. An opposite stand will be taken by the judges.